Wigan stretched their unbeaten run to 13 games at Millwall despite playing the majority of the match with 10 men. Jed Wallace's curled effort and Byron Webster's header over nearly broke the deadlock for the hosts. The Latics lost midfielder Sam Morsy when he was sent off for two bookings in the space of six first-half minutes. 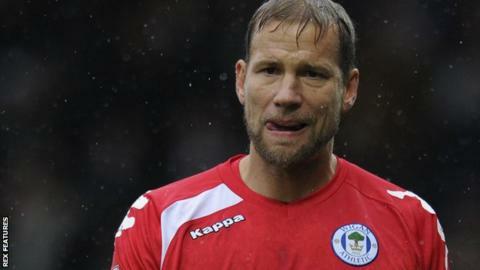 Gary Caldwell's side had 40-year-old goalkeeper Jussi Jaaskelainen to thank for the point as he made saves from Wallace, Lee Gregory and Steve Morison. Wigan remain second in League One but now sit four points behind leaders Burton, while Millwall stay fifth. "I'm delighted with the performance. We were brilliant. We were outstanding. We dominated the top team in the division. "We created numerous opportunities to score and it just didn't happen in front of goal, so I'm obviously disappointed that we didn't win the game, but delighted with the performance of the players." "It was a good contest. We don't need to question this team's character. "I'm really proud of my 10 players and the subs that came on that had to battle and scrap and fight, it was a magnificent second half performance. "It was two clear fouls, but to get two bookings, refs need to be strong and the crowd is on his back." Match ends, Millwall 0, Wigan Athletic 0. Second Half ends, Millwall 0, Wigan Athletic 0. Attempt missed. Byron Webster (Millwall) header from the left side of the six yard box misses to the left. Foul by Max Power (Wigan Athletic). Corner, Wigan Athletic. Conceded by Aiden O'Brien. Attempt missed. Steve Morison (Millwall) right footed shot from the centre of the box misses to the right. Foul by Yanic Wildschut (Wigan Athletic). Attempt missed. Jed Wallace (Millwall) right footed shot from the right side of the box is close, but misses the top right corner. Corner, Millwall. Conceded by Craig Morgan. Attempt missed. Shaun Williams (Millwall) left footed shot from outside the box misses to the left. Corner, Millwall. Conceded by David Perkins. Substitution, Millwall. Aiden O'Brien replaces Joe Martin. Substitution, Wigan Athletic. Yanic Wildschut replaces William Grigg. Attempt missed. Joe Martin (Millwall) header from very close range misses to the right. Corner, Millwall. Conceded by Max Power. Leon Barnett (Wigan Athletic) is shown the yellow card for a bad foul. Max Power (Wigan Athletic) wins a free kick in the attacking half. Corner, Millwall. Conceded by Jussi Jääskeläinen. Attempt saved. Nadjim Abdou (Millwall) right footed shot from the centre of the box is saved in the bottom left corner. Reece Wabara (Wigan Athletic) is shown the yellow card for a bad foul. Foul by Reece Wabara (Wigan Athletic). Corner, Wigan Athletic. Conceded by Byron Webster. Attempt missed. Jed Wallace (Millwall) right footed shot from the centre of the box is just a bit too high. Attempt saved. Steve Morison (Millwall) right footed shot from the centre of the box is saved in the centre of the goal. Attempt saved. Lee Gregory (Millwall) right footed shot from the centre of the box is saved in the bottom right corner. Substitution, Wigan Athletic. Craig Davies replaces Conor McAleny. Substitution, Millwall. Shaun Williams replaces Ben Thompson. Attempt missed. Jed Wallace (Millwall) left footed shot from outside the box is close, but misses to the right.